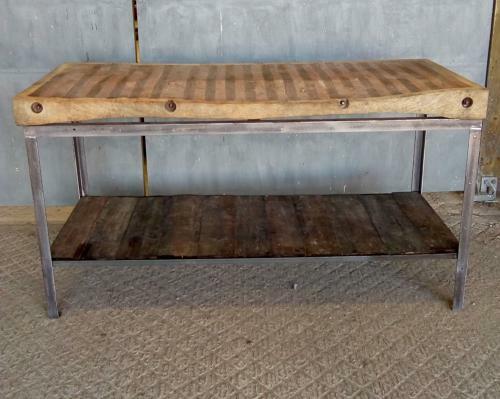 A stunning hardwood reclaimed butchers block set on an industrial style metal base. The butchers block has been used commercially all of its life and has been used on both sides and its edges. The top has an attractive rolled shape and has been sawn halfway at some point but is stable. The block has been mounted on a reclaimed industrial work bench that has been stripped to bare metal and lacquered. The metal base has a low shelf that has been installed with old oak floorboards that have a rustic appearance. The butchers block has been cleaned and sterilised but if the block is to be used for decorative purposes then purchaser will need to seal the wood as it has a meat odour due to use. The item is reclaimed and therefore has some character signs of wear. There are cuts, scratches and marks on both sides and the top is uneven. There is some tarnish and light scratches to the base. The reclaimed old oak floorboards have splits, grooves, notches, colour variation and marks. The kitchen island is a fantastic, chunky and solid item with a stunning design, ideal for use within the kitchen or as a display table. The design of the island is ideal for both rustic and industrial settings and is a very desirable piece.